ThomasLift | President Obama’s Visit – A Phenomenal Day of Art & Celebration in Camden! 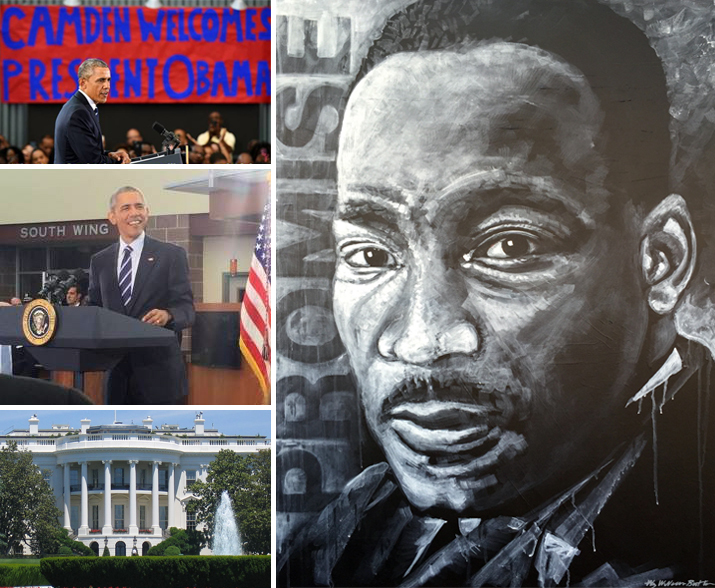 President Obama’s Visit – A Phenomenal Day of Art & Celebration in Camden! 20 May President Obama’s Visit – A Phenomenal Day of Art & Celebration in Camden! We continue to be overwhelmed as we reflect on all that transpired in Camden yesterday. The President of the United States, President Barack Obama, visited Camden on Monday, May 18th! Even though Camden is still named as one of the most impoverished cities in the nation, President Obama choose to visit to congratulate the Camden County Police Department and all in Camden on the great progress the city has made. President Obama called Camden “a celebration of progress” and “a symbol of promise for the nation”. For all of us living in Camden, the City Invincible, we are elated by President Obama’s words and visit! President Obama spoke with many youth in the city – perhaps providing the inspiration for one Camden youth to become President one day. He also traveled through the streets of the city viewing the recent successes in Camden as well as the hardships that still need to be overcome. Camden residents lined the streets to view President Obama’s motorcade. What a phenomenal day for Camden! Our hearts are so full (we truly do not have the words) as we reflect on how blessed we are especially in these past few days. First, we are so thankful as William and I were invited to attend the event where President Obama spoke in Camden. Then, William was invited to create a painting to give as a gift to President Obama as well as to create a painting as a gift to the city of Camden (on behalf of all those in Camden) that President Obama signed to commemorate his visit to Camden yesterday. We are tremendously honored by all of these opportunities and by representing Camden in this way. The above photo montage is William’s painting entitled “Invincible Promise” honoring the people of Camden and this historic & phenomenal visit by President Obama. How generous President Obama signed William’s painting with the words “We are proud of Camden”. Amazing! We are so thankful. A special thank you to Pete Souza, the Chief Official White House photographer for the amazing photograph of President Obama signing “Invincible Promise”. “Camden Promise” was given as a gift to President Obama and his family. We are truly so moved this painting is with our President, his precious family, and his leadership team in Washington, DC. We pray “Camden Promise” blesses them all. Both paintings have words from Psalm 33 on the sides of each painting. These include words such as unfailing love, justice, and hope. We pray all who view these paintings are blessed, and we are truly thankful to God we were given these opportunities. Without Him, none of this would be possible. We marvel God would allow us to have this favor in our beautiful city of Camden. President Obama’s speech was given at the Salvation Army’s Kroc Center in Camden. This is the awesome new Center that is a gem for Camden that literally sits on the site of a former landfill (a total picture of beauty from ashes). William is blessed to have his commissioned painting and the stained-glass installations at this Center. Just outside the main entrance are the words “With God, all things are possible” from Matthew 19:26. We are witnessing these words with the President of the United State’s visit, the paintings, and all happening in Camden. We give our special thanks to Mayor Dana Redd and Chief of Police Scott Thomson. Without their support and trust in us to create these paintings, we would not have had this opportunity. They worked with the White House and the Secret Service to allow “Camden Promise” to be given to President Obama as a gift and then to allow time in President Obama’s schedule for him to sign “Invincible Promise.” Chief Thomson and Mayor Redd were both honored by President Obama. They could be anywhere yet they have chosen to lead in Camden. Their sacrifice as well as their incredible faith and commitment to the City of Camden make them heroes in our eyes. We still have challenges to overcome in Camden.Yet we are all celebrating the positive progress in the city as we continue to look forward to the hope of even more lasting transformation for Camden’s residents and all here. Thank you for being connected to us and for being on this journey with us in Camden. We hope to see you soon. God bless you all. God bless our President, and God bless the City of Camden!